An extremely outgoing girl with a bouncing personality, Onika is a very large bodied female of black pigmentation. A fun loving girl, she has a very agile working body type with solid structure and free flowing movement, showing correct healthy topline and underline, a beautiful elegant head, dark eyes with intense and alert expression and lovely tight and erect ear set. Very playful and stable temperament, she gets along well with cats and our other farm animals. Onika is watchful and is extreme in protection of her family members and of the home environment. Very high ball and retrieve drive, she is always ready for you to throw the ball for her and will not come back without it; she is quick with an energetic retrieve response. From a long line of working service dogs, Onika comes from impressive heritage of K9 Police lineage. Her father, Von Bruin's Rangers Rookie, as well as her grandfather and great grandfather, Gramar's PD Ranger and Ranger Vom Kaisertor, have all given many years of dedicated service in the line of of duty as working K9 Officers with the King County Kent Police Department here in Washington State. 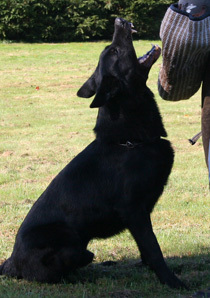 Additionally, on the sire's side of the pedigree you will find K9 Police dog Working Demo's for the Police Department. From the dam's lineage, Onika is the granddaughter of East German Import David v. Nebelholz, SchH2, FH and great granddaughter of the well known legendary Don v Rolandsteich, SchH2, FH., with DDR lines to Bero v. BarutherLand. Onika was bred in the summer of '03 to our Manto vom Kahlenbach son, Janosch von der Mosellorely. Janosch is the grandson of the great Lord vom Gleisdreieck, DDR Koer:5436/54 the Top Producing East German Stud Dog who earned the prestigious working titles of 3 X Bundessieger Winner and 2 X European Champion, SchH3, FH3. Onika produces strong, good sized and large boned pups with balanced drives, highly intelligent and quick to demonstrate their working abilities. Temperaments produced are clear, balanced and outgoing, producing pups which are extremely versatile and good for a variety of working fields including Police K9 dogs and SAR. Onika's pups have proven to be wonderful family companion and home protection dogs as well. Onika delivered 11 pups in her first litter in 2003 by our imported stud male Janosch; 6 males and 5 females. Bi-color as well as dark sable coat coloration. See photos of "Onika X Janosch Puppies" Onika and Janosch puppies have grown to become very substantial adults. 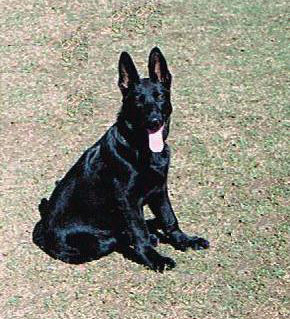 Onika's 2005 litter by 100% DDR East German stud male Gradalen's Farox produced 12 gorgeous large puppies, in coat coloration of solid black and bicolor...4 males and 8 females. Onika's 2007 litter with our Schh3 East German Stud dog Lux vom Kameruner Eck produced 9 excellent puppies...coat coloration of solid black and dark black sable. 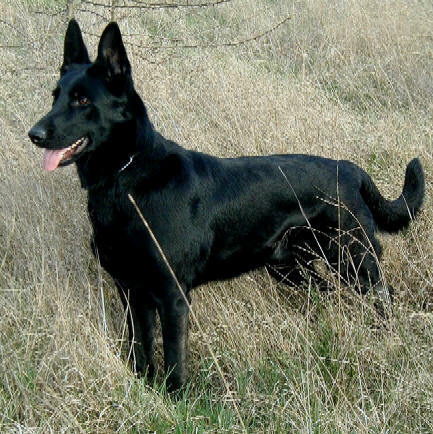 Onika's pups are loyal and highly intelligent; all have been quick to learn, are easily trained, and have proven to be well suited for police work, schutzhund, home and personal protection dogs. Onika's pups have been used with great success as home protection dogs in families with children.